Not only a wife but Rebecca Olson is also a responsible mother of her children and the backbone of her family. She has been the standing rock from where her husband has launched his career. A law attorney, Rebecca Olson Gupta is widely recognized as the wife of Dr. Sanjay Gupta, America's renowned neurosurgeon and medical reporter. Rebecca currently resides in Atalanta, Georgia with her hubby, children, parents, and grandparents. Rebecca Olson was born 1968 in Novi, Michigan. According to a Facebook profile, Rebecca attended Novi High School in Michigan graduating at the age of 19 in 1987. She belongs to the class of the 1992's University of Michigan and also attended the University of South Carolina, Columbia for her law degree. 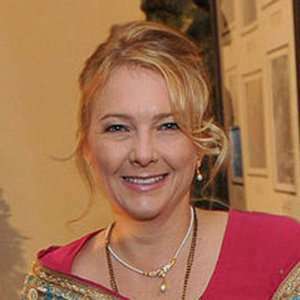 The blonde, who is a family law attorney, became Mrs. Gupta in a Hindu wedding ceremony. Her husband, Dr. Sanjay Gupta, is one of the prominent figures as a neurosurgeon as well as a journalist. Dr. Sanjay has obtained his M.D. degree from the University Of Michigan Medical School, in 1993. The multiple Emmy Award-winning personality was named one of People magazine's "Sexiest Men Alive" in 2003. Also in 2011, Gupta was named “one of the ten most influential celebrities” by Forbes magazine. In 2009, he was offered the job of United States Surgeon General by President Barack Obama. However, he withdrew his name from consideration. Dr. Sanjay, who has a net worth of $4.5 million, always had a passion for inspiring Americans to lead healthier and more active lives. And eventually, the desire led him to lunch a program ‘Fit Nation’ in CNN. He shares his knowledge about health-related issues through television and inspires people to live a healthy life. Rebecca has always been supportive towards her husband's career since the very beginning. The graduate of the University of Michigan, Rebecca began her married life after she tied the knot with Dr. Sanjay Gupta on 15 May 2004 in a Hindu wedding ceremony. They married at a private girl’s school near Rebecca’s family home when Rebecca was at the age of 36 while Dr. Gupta was at 35. Adding more happiness to their married life, the couple also soon turned into parents after they welcomed three kids named Sage Ayla Gupta, Soleil Asha Gupta, and Sky Anjahi Gupta. Six years after Rebecca got married, Sanjay Gupta gave an interview with INSTYLE magazine on 17 March 2010 where he revealed the proposal story. He proposed his wife by writing a poem and asked her to marry in the poem's last line. He also stated that he was nervous the whole time while Rebecca was reading a page long poem. Rebecca did the rest of the revelation by adding that her husband got down on one knee and proposed her to marry him even before she reached the end. Besides, Rebecca has become the significant support for her husband’s career in CNN, which Dr. Sanjay has also mentioned throughout his career. Stating his wife has a substantial role in his successful CNN career, he revealed she told him to try and think of the camera lens as a patient to overcome all the difficulties during working on a television. Well, the couples seem to be happy together without any signs of divorce. The pair is not only relishing their married life but is equally focused to give back to the community which always befriended them. On 31 January 2018, he and his wife, Rebecca, teamed up the University of Michigan to support an effort to eradicate the problems that arose in health communication bringing new ideas and tools. Dr. Sanjay who has seen the crucial role of communication in responding to the health, effects of every kind of crisis, delays, missed opportunities and even tragedy that can come from the poor dissemination of health information felt it was the exact time for the movement roll. Tamara Braun Married Co-Star, It's Not Her Husband! Lesbian Of Sorts?